the simple life through suburban homesteading. How to live a frugal life. Aenean nonummy hendrerit mauris. Phasellus porta. « Should I Refrigerate my Eggs? Like any good homesteader I am frugal beyond belief, always looking for ways to cut costs, reuse and repurpose. As the cost of chicken feed and supplements continue to go up I began looking for ways to offset that expense. Of course, kitchen scrapes, spent veggies from the garden and free ranging for bugs and treats are still the main stays in supplementing feed, but what about other supplements, particularly calcium? Hens need an ample supply of calcium for good health, and because without it their shells are thin and fragile, sometimes breaking when you collect or store eggs. What I didn’t realize, before my research, was the wide and varying opinions of where to get calcium for your hens. Some people think only commercially available calcium in the form of oyster shells or limestone from a feed store should be used, but those can be pricey. My frugal farm girl brain wanted something cheaper and more sustainable. I didn’t have far to look for a solution as it turned out. In fact, I didn’t have to look any farther than my chicken coop. What?? Where did you find calcium in your chicken coop, you ask? Right inside of each nest box, that’s where! Yep, you got it. Egg shells are high, really high, in calcium and make the perfect renewable source of a supplement your hens need for good health and firm egg shells. In reality, farmers and homesteaders were feeding egg shells back to their flocks hundreds of years before commercial products ever hit the market. Many commercial lay rations contain a suitable amount of calcium, but why not let your girls have a free choice of extra calcium whenever they want it? It just makes good sense to feed your hard working girls a little bit extra. BUT—how do you feed egg shells so they don’t make my hens sick? 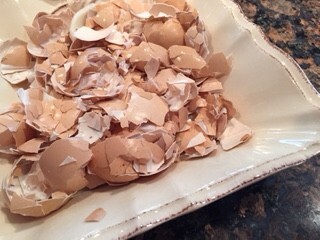 Here are a few tips on how I clean and reuse my egg shells. Each time I use eggs I rinse and store them in container. As it becomes full I just smash down the shells to make room for more. Once the shells have cooled a bit, crush away. You can use a potato masher, put them in a plastic bag and roll with a rolling pin, or just smash them with a wooden spoon, which is how I do it. Some people use a blender or a food processor to get a finer texture, but I’m too lazy to drag those appliances out of the cabinet. The goal is to smash the shells small enough that they are unrecognizable to the hens. To feed them either mix with their normal rations or offer them “free-choice” in a separate feeder. I use a large rabbit feeder and feed them separately. The hens are perfectly capable of deciding when they need a calcium boost and how much. I know what you’re thinking. Won’t feeding eggshells entice my hens to eat eggs? It might, but not very likely. I’ve never had a problem. In fact, I’ve had more egg eaters when I didn’t feed egg shells, probably because the girls were craving calcium and the eggs were the closest source. But, every flock is different. There’s always one rouge hen that goes crazy and pecks at anything and everything. Once she gets a taste of egg she may become an egg eater, but that’s a whole different problem that I wrote about in “Hens Eating Their Eggs? There is a Reason”. There you have it…a free source of renewable, calcium rich supplement that will keep your girls happy and you in eggs that you won’t poke a finger through. What more could a farm girl ask for?